People are apparently getting the wrong idea about Dead Island, thanks in no small part to the game's trailer. 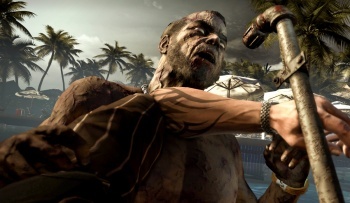 The evocative trailer for Techland's upcoming Dead Island trailer garnered plenty of attention when it appeared online last month, but the game's producer, Sebastian Reichert , said that any comparisons to emotional and cinematic games like Heavy Rain are a little off the mark. Reichert said that the team was actually a little dismayed that people were comparing the game to Heavy Rain, as although they thought it was a fantastic experience, it was about as far from what Dead Island was like as you could get. Reichert said that he was hesitant to even call Heavy Rain a game at all, as it played out more like a movie. He even joked that he had seen DVD menus more complex than Heavy Rain's gameplay. The game that Dead Island was more like, he said, was Gearbox's Borderlands, in that it used similar methods as the sci-fi shooter to keep you playing . The Dead Island trailer - which featured sad piano music, camera trickery and the death of a little girl - did a very good job of eliciting emotion from those who saw it, and it's not surprising that people would make comparisons between Dead Island and more emotional games. It seems, however, that this may be proving counter-productive for Techland and publisher Deep Silver, as people might be expecting a very different game to the one they're going to deliver.